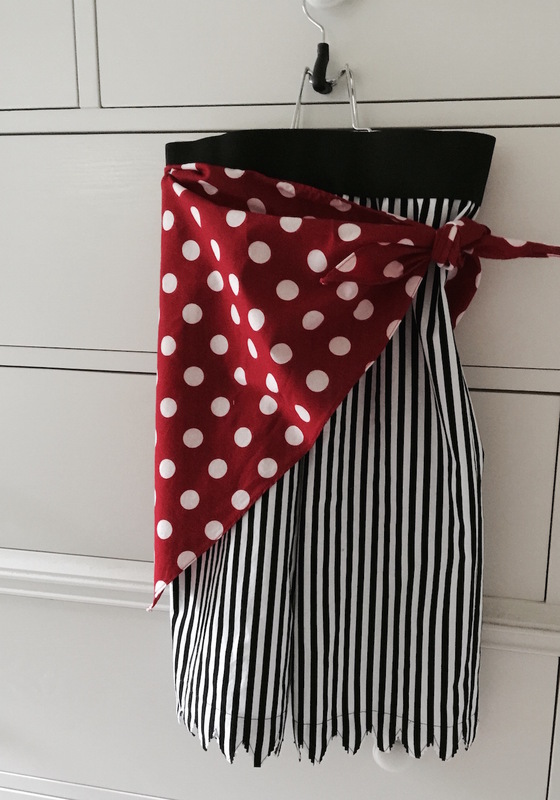 I’m making a pirate costume for my granddaughter for Halloween this year, and it requires a lot more pieces than last year’s superhero costume, so I’m piecing out the blog posts, one by one. Today, the scarf and pants. The scarf is really just a big triangle with a narrow hem, so not much to say about that. I suspect it will be worn as a head scarf, but it could be worn at the hip, as well. I’m changing the elastic waistband casing to an exposed elastic waistband, which also eliminates the need for the wide lace-up belt. I’m thinking a 3 year old would be fidgeting and fussing with that belt. I’m cutting off the pant legs to mid-calf height and making a sawtooth border that looks a little more pirate-like.